This is series is aimed at what I describe as "Advancing Beginners", those that have (mostly) completed the Beginner Course material and are looking for ways to add some spice and colour to their playing! 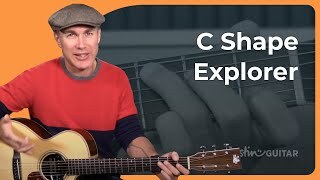 There are 5 common chord shapes on the guitar, C, A, G, E and D (parts of the CAGED System). 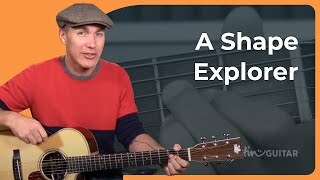 Each of the shapes has simple variations you can explore and work into you playing... sometimes lifting a finger or adding a finger - but it's the exploring and listening that is the key thing in this module! 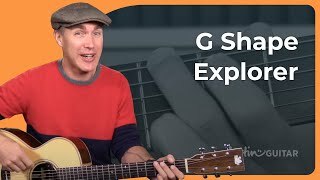 Even though I will mostly explain the 'proper' names of the chords as we go through - I don't recommend you worry about all that too much - just listen. For sure there will be theory reasons that will explain how or why a chord will or won't work - but much more important is how it sounds in the moment, in the song! Deliberate practice of the chord variations - until they become instinctive! 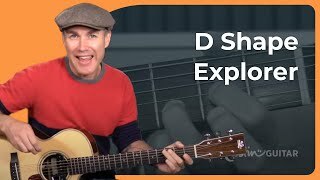 Helping advancing beginners explore chord shapes - starting with the D Shape chord variations! Next up we check out the C Shape which is one of my favourites and has loads of tasty embellishments! The G Shape is a super cool grip for explorers and there are lots of fun variations to try! The A Shape has a few less variations than the C, G and D Shapes but there's still some cool stuff to explore! 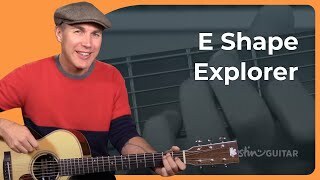 The E Shape is the last in this little shape explorer series but has some very cool variations to explore!